The tall Art Deco style building on the left is LeVeque Tower. 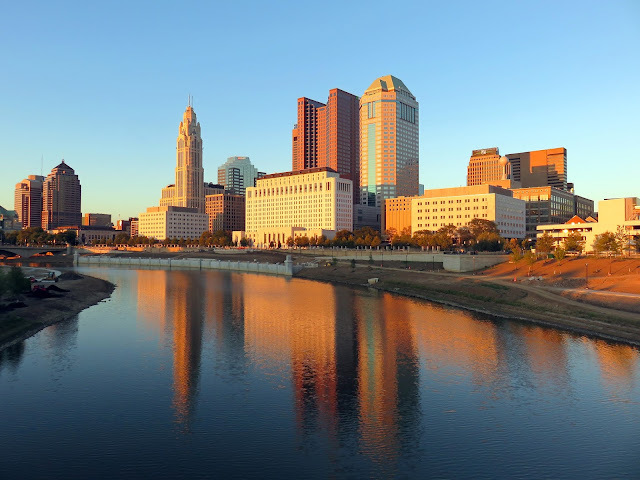 47 stories, it was the tallest building in Columbus from 1924 until 1974. When it was built in 1924, it was the tallest building between New York City and Chicago and the fifth tallest building in the world. See ya, Columbus! Thanks for the extra five pounds you gave me as a parting gift. Gorgeous photo. Perfect time of day. You are so good with that camera!